Rose Carroll here, from Edith Maxwell's Quaker Midwife Mysteries. My good heavens. Who knew a modest midwife like myself would ever appear in the Amesbury Chronicle's gossip column? Believe me, I never wished for such notoriety. But sure enough, the inquisitive Annie Tunstall managed to eke news out of a simple romance. Read it for yourself. And then leave a question for either Edith or myself - she has a copy of my latest adventures in large print to give away! Midwife Rose Carroll has been spotted about town courting with handsome Newburyport doctor David Dodge. One's a Quaker, one a Unitarian. Is that combination going to mix like whiskey and water... or like oil and water? Amesbury postmistress Bertie Winslow continues to scandalize the town by riding astride rather than sidesaddle. The Tidbit’s sources hint at further misbehavior between Miss Winslow and the lady she shares her home with, the attorney Miss Sophie Ribeiro. To top it off, Miss Winslow calls her steed Grover – the first name of our dear President! Can no one tame this woman? The Tidbit was shocked - shocked, we tell you - to learn that an apparently upstanding manager at the Hamilton Textile Mills has been accusing Amesbury's own adopted Akwasi Ayensu of murder. Ayensu is a fine cabinetmaker who was supported in his goal of leaving slavery behind by none other than the abolitionist Quaker poet John Greenleaf Whittier. Let's hope Detective Kevin Donovan solves this case - and fast. I should hope so, too! 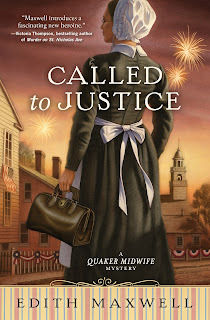 Remember, we are giving away a copy of Called to Justice, my latest adventures, in large print to one person who comments below. 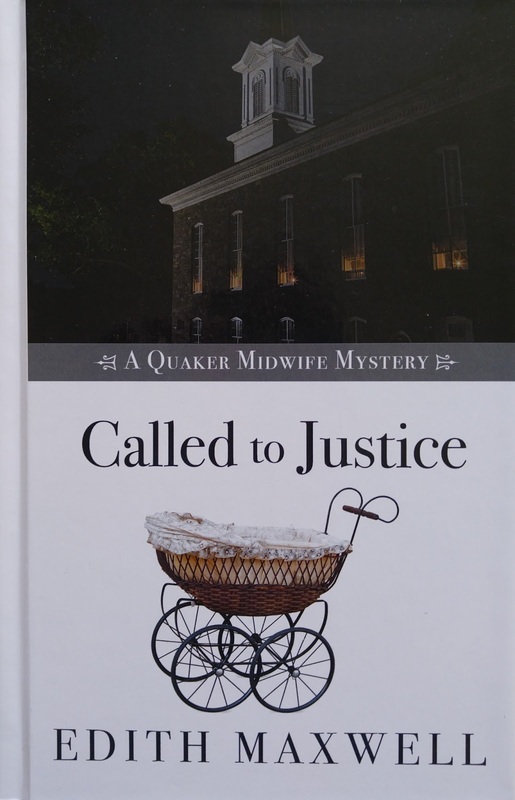 Edith Maxwell writes the Quaker Midwife Mysteries, the Local Foods Mysteries, and award-winning, Agatha-nominated short crime fiction. As Maddie Day she creates the Country Store Mysteries and the Cozy Capers Book Group Mysteries. I've never read any books in this series but it does sound very interesting. Like the title. Thanks you for the opportunity. Wow,that's a lot of tidbits! I would ask her how different is being Quaker to something like Unitarian?! Thanks! It's pretty different. The Unitarians have a minister and sermons, for example, whereas Friends believe they all minister to each other and sit together in silent expectant waiting. Thanks for the explanation! So they are quite different in how they practice their religion from a lot of others. I love Midwife-Stories and I love your other Series too. Maddie Day's too. New series for me...... looks so interesting!! I think riding side saddle would be very uncomfortable---kudos to the the lady who is riding astride. Clarinda highly disapproves, as you can imagine! As being such anheadstrong woman, is the unconventional postmistress possibly to be found unsuitable for such an entrusted and important position? I just put in an order for your earlier works in the series to catch up with the gossip! Thanks! So far Bertie is hanging onto the job. How exciting to be a character - to see your name in print in a book by none other than Edith Maxwell! Sounds like from Miss Tunstall’s Tidbits that Called to Justice if one to keep you on your toes with lots of interesting character and twists and turns. You are the winner, Cathi! Congratulations. Please check your email. I haven't read this series yet. I really sounds like an interesting book. 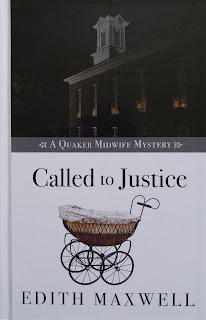 I would enjoy learning about midwives and the Quakers. The one common thread between your Quaker midwife heroine and Dr. Dodge is they're both against slavery. After all, if Dr. Dodge was a Unitarian, he would have known or knew of Thomas Wentworth Higginson, the rector of same church. After 2 years of preaching abolitionist sermons, the congregation couldn't stand it and he was dismissed! I'd love to give the large print book to my twin, an avid reader, who has eyesight problems as a result of a mini-stroke. Thanks for the info, Pam! Quakers are awesome - very fascinating history. Sounds like an intriguing series! Thanks! You are the kind of fan every author wants. I really believe that Rose deserves a little romance and Dr. David seems to be a good candidate if they can meet in the middle concerning their religious beliefs. I look forward to finding out and I love the tidbits! They sound a little like the community news columns that used to appear in our local paper. New to this series. As I approach 60, I have come to appreciate large print books. This sounds like a fascinating series to check out. And, I must admit, reading a large print book is easier on these middle-aged eyes. Cathi is the randomly chosen winner of my book! Congrats, Cathi (please check your email), and I wish I had a copy for everyone.